Multiple layers of metalized polyester provide puncture resistance and moisture barrier for this economical dry package. This highly reliable material meets or exceeds commercial MVTR and EMI/RFI/Static Shielding requirements for static safe, moisture barrier packaging. 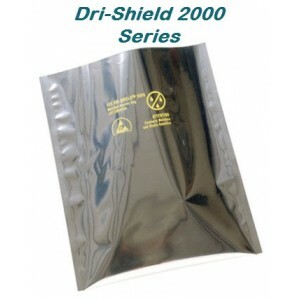 The 3M Dri-Shield 2000 Moisture Barrier Bag is designed for dry packaging of electronic devices. Dri-Shield 2000 bags are made from multiple layers of metalized polyester and dissipative polyethylene. physical requirements of ANSI/ESD S541, EIA 625, and to be ANSI/ESD S20.20 program compliant.